Malcolm Eugene Spaulding Sr., age 66 of Bismarck, died January 11, 2018 at his home. Born February 4, 1951 in Luxora, AR, the son of Charles and Virginia Anderson Spaulding. Malcolm was active duty Army for 24 years and retired in 1994 in Flower Mound, Texas. He was a Vietnam and Desert Storm Veteran. 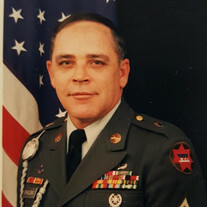 Malcolm received many awards and medals while in the Army and his most prized decoration was receiving the Bronze Star for his leadership in Desert Storm. Malcolm loved his friends and had friends all over the world. He loved the Razorbacks like no other, fishing and being around friends and family. He was preceded in death by one brother, Manuel Spaulding; one half-brother, Alfred Lee Parker and one half-sister Sue Realyn Parker. He is survived by his wife Sharon Spaulding; one son, Malcolm E. Spaulding Jr.; one daughter, Carrie Ann Spaulding; two step-sons, Michael and Steven Karadimas; two sisters, Glenda Spaulding and Melanie Hollis; five grandchildren; one great grandson; and three step-grandchildren. Services will be 2:00 P.M. Saturday January 20, 2018, in the Ruggles Wilcox Funeral Home Chapel, with visitation from 6-8 p.m. Friday evening at the funeral home. The family will also receive friends from 1:00 pm until service time Saturday. Memorials may be made to the American Cancer Society or the Wounded Warrior Project. Sign Malcolm's Tribute Wall at www.ruggleswilcox.com.